Visitor registration for Slide, the annual Snowsport Tradeshow, is now live. The event is due to take place from January 22-24, 2018 in Telford. With around 80 companies representing 200 brands taking part there’s 10% of floor space left for any company still wanting to attend. 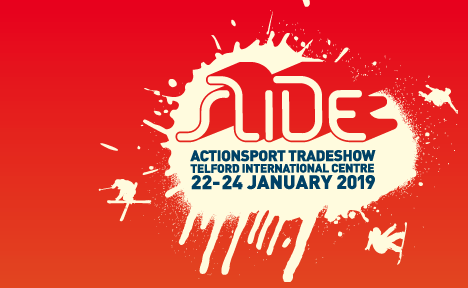 Press Release: Slide, the annual snowsport tradeshow, takes place from 22-24 January in Telford and is run by SIGB (Snowsport Industries of Great Britain). Confirmed exhibitors have filled more than 90% of the space available at Slide, but there’s still a good choice of stand locations and sizes on offer for exhibitors who want to take advantage of reaching all the key snowsport buyers under one roof. Slide, as a successful annual show for the wintersport trade, has many returning exhibitors, but Bradshaw Taylor, a long-term regular at Slide has increased its presence this season to more than 3.5 times the size of its previous stand. As well as showcasing their Black Diamond and Pieps equipment, a larger area is required to show their Schoffel and Icebreaker brands. Sales Director at Bradshaw Taylor, Sonia Prior commented, “We made the decision to substantially increase our presence at Slide in recognition of our development in the market. For FW19 we can offer our customers more from these authentic brands including some excellent innovation. The UK snowsport market remains a key focus for us and Slide is a great place to meet key industry buyers”. In addition to ‘regulars’ at Slide, there are always newcomers joining the industry for the first time, or existing brands who have concluded that attending Slide will improve their sales prospects for the following season. The first evening of the show is the main social evening, when, as the day’s business winds down, the SIGB invites visitors and exhibitors to join them in the central café for a relaxed drink. On Wednesday evening, Slide hosts the AGM of the SIGB, quickly followed by an Open Forum on all aspects of the industry, as well as the presentation of the Slide Awards. The Slide Awards recognise the ‘best in show’ in the hardware, software and accessory categories and there is also an award for the best new brand/exhibitor at the show.